Bailey has launched its all-new Advance range. This six-model entry-level line-up represents a real step-change from the previous four-model offering. The 66-2 tested here is the baby of the new Bailey Advance family. It replaces the 635, but has the same front-lounge, end-washroom layout as seen on the latter. As with all of the models in the new range, the 66-2 gets the latest brown-and-white graphics – and very smart they look, too. The ’van is still built using Bailey’s Alu-Tech system, with a six-year bodyshell-integrity warranty and a three-year manufacturer’s components warranty. In terms of other exterior features: a locker door sits on the nearside, providing you with easy access to the storage space beneath one of the lounge sofas. There’s a new double-glazed opening skyview rooflight over the cab, and fixing points for a rear-mounted bike rack – it’s not compatible with the previous unit, however. The Bailey Advance 66-2 is based on the Peugeot Boxer. Under the bonnet is a two-litre, Euro 6-compliant 130bhp diesel engine, and it is matched with a six-speed manual transmission – plus the ’van has variable power steering. In the cab you’ll also find twin cupholders, a DAB radio with Bluetooth connectivity, a pair of 12V sockets and a USB port. The step up into the accommodation area is set low, meaning you shouldn’t need a portable step. Once inside, you’ll notice that the new Bailey Advance is two inches wider than the old one: it definitely feels more spacious. The 66-2 actually feels more like a caravan inside – there’s loads of room to sit and relax on the ‘Eucalyptus’ upholstery. Both of the cab seats swivel, and that great rooflight over the cab allows the area to be flooded with light. Ambient lighting is excellent, too, and includes dimmable spotlights with integrated USB points. The kitchen is on the offside. It’s not massive, but there’s a pull-up flap to help extend the available work surface. A 95-litre fridge, a microwave, and a Thetford combined oven and grill with a three-burner hob are all fitted as standard in the Bailey Advance 66-2. This motorhome is a strict two-berth, and you’ll be sleeping in that lounge. This year Bailey has done away with its Dreamsleep system, so this is a regular slats-and-cushions double bed. Made up, it’s a good size at 6’1” long; it’s comfortable, too. The washroom stretches right across the rear of the Bailey Advance 66-2. It’s subtly different from the previous version, but offers plenty of room in which to dress. Elsewhere here you’ll find a half-height wardrobe, a small cupboard below the basin for toiletries, and a separate shower cubicle. There’s only one plughole in the latter, but there is a skylight up top to help keep the area bright. 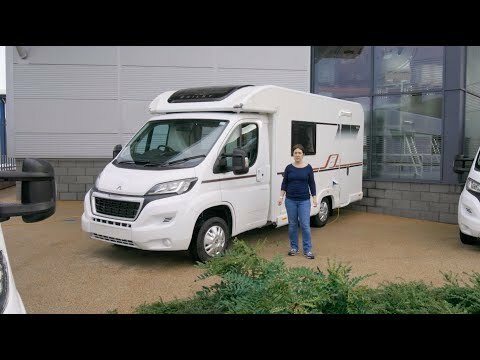 All of the vehicles in this six-model range of Bailey motorhomes have an MTPLM of 3500kg, and there are some amazing payloads. This one, for example, has a whopping figure of 800kg, which should be more than ample for any couple, even if they’re planning to take a longer tour. There’s plenty of storage space for you to make use of, too, including under the lounge seats, and in the large dresser unit that sits across from the kitchen – there are also lots of lockers and cupboards to fill in the latter. Bailey made an unusual move this year and chose to do away with its options packs (with the exception of optional bespoke bedding). Instead, it has included a high level of standard kit. That’s most noticeable in the cab, where you get air-con, airbags for both driver and passenger, concertina blinds, a DAB radio and more as standard – previously these were available on the Advance as part of the Premium Pack. ’s entry-level origins – roller rather than concertina blinds on the living area windows, for example – but otherwise this is a great-looking motorhome that feels beautifully built and should really appeal to a couple. It’s well-priced, too, with an impressive spec and a superb payload. And to see other Bailey motorhomes for sale, click here.